Harbor launches at the American Hatoba, for many years the main pier in Kobe. Until 1922, large ships couldn’t dock in the harbor, so the hooting launches maneuvered continuously through the multitudes of junks and other small vessels to shuttle passengers and their luggage between anchored ships and the pier. As the harbor developed, American Hatoba lost its importance as place of entry and in 1987 the pier finally vanished as it was incorporated into Meriken Park, Meriken being the local pronunciation of American. The merchant vessels of all kinds in both home and foreign trade, which entered and cleared the harbour of Kōbe during 1909 amounted to 15,327, of which those engaged in foreign trade numbered 2,418. 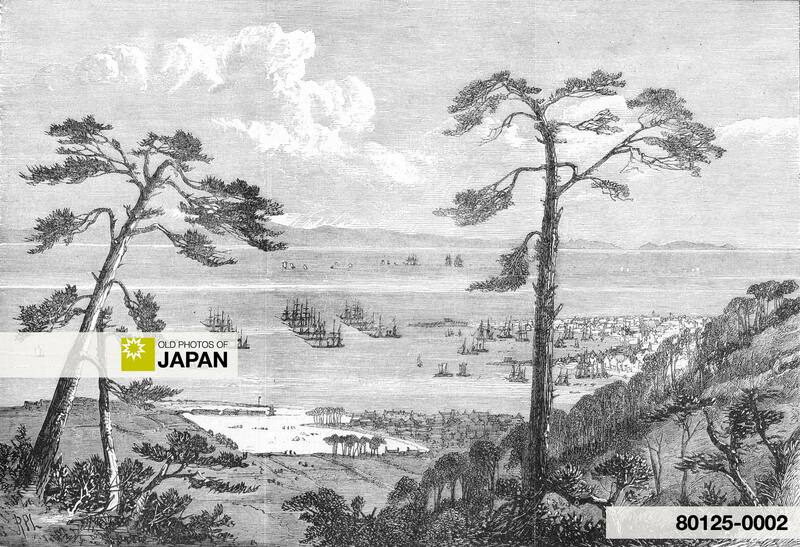 The harbor was divided into the the area between Wakinohama (#1 on map below) and the Kawasaki promontory (#7), used for merchant ships and junks, and the area between the Kawasaki promontory and Wadanomisaki (#8), used especially for vessels of the Japanese navy. 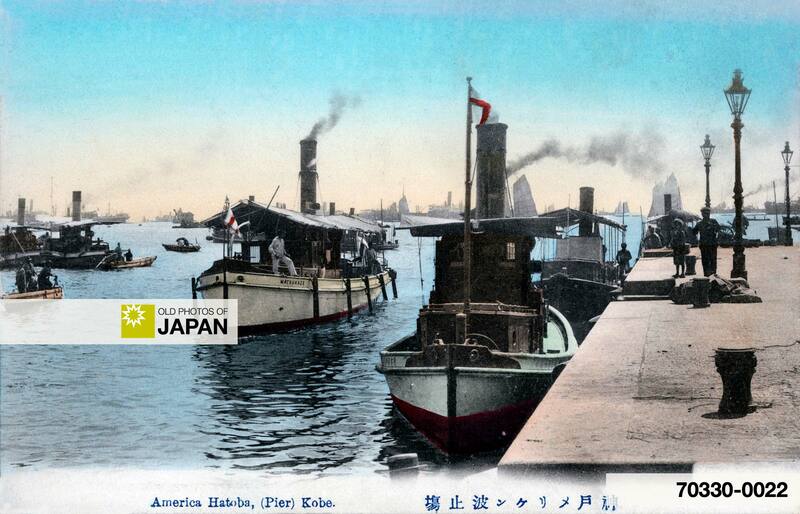 Passengers landed at American Hatoba (#5) and the nearby Daisan Hatoba, located about where Kobe Port Tower is now. The port of Hiogo (later known as Kobe), just before it opened to foreign trade. British and American fleets are at anchor. A graphic from the French newspaper L’Univers Illustré, 1868. Kobe Port was first opened to foreign trade in 1868. At that time it had no wharfs to serve large vessels so loading and offloading had to take place offshore. This situation persisted for a long time. Finally in 1907, due to dramatic increases in trade, plans were made for extensive new port facilities. During the so-called First Stage Kobe Port Development Plan the Shinko (New Harbor) piers No. 1 through No. 4 were constructed (1907-1922). In 1919, work began on the Second Stage, which included the construction of Shinko piers No.4 (East) through No.6, Naka Pier and Hyogo Piers (No.1, No.2 Piers). This was completed in 1939. Kobe had now the largest berth in Japan, with a depth of 12m. 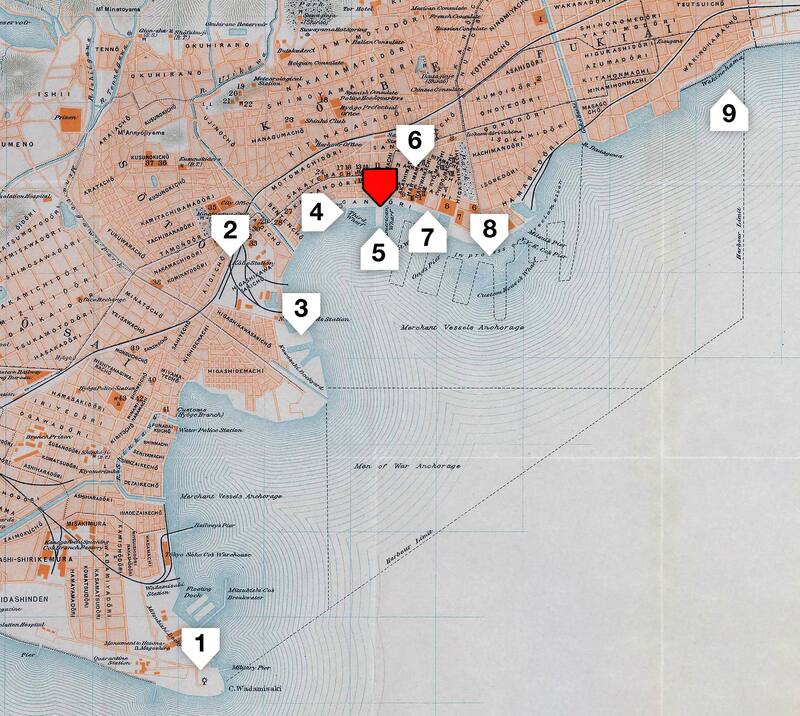 1914 (Taisho 3) Map of Kobe: 1. Wakinohama; 2. Former Foreign Settlement; 3. Kaigandori; 4. Kobe Station; 5. American Hatoba; 6. Planned Harbor Development; 7. Kawasaki Dockyard; 8. Wadamisaki. 1 Imperial Japanese Government Railways. (1914). An Official Guide to Eastern Asia Vol. II: South Western Japan. Imperial Japanese Government Railways. 2 Port & Urban Projects Bureau Kobe City Government. Port of Kobe. Retrieved on 2008-07-21. You can also licence this image online: 70330-0022 @ MeijiShowa.com.